(Trent Nelson | The Salt Lake Tribune) The Dollar Ridge Fire seen from Fruitland in Duchesne County, Tuesday, July 3, 2018. Hot, dry and windy conditions in Utah’s Uinta Basin bolstered the state’s largest wildfire Wednesday, pushing the blaze farther northwest, prompting new residential evacuations and the closure of Highway 40. The Dollar Ridge Fire in Duchesne County — increased overnight from 30,000 acres to about 42,000, according to the Great Basin Coordination Center. 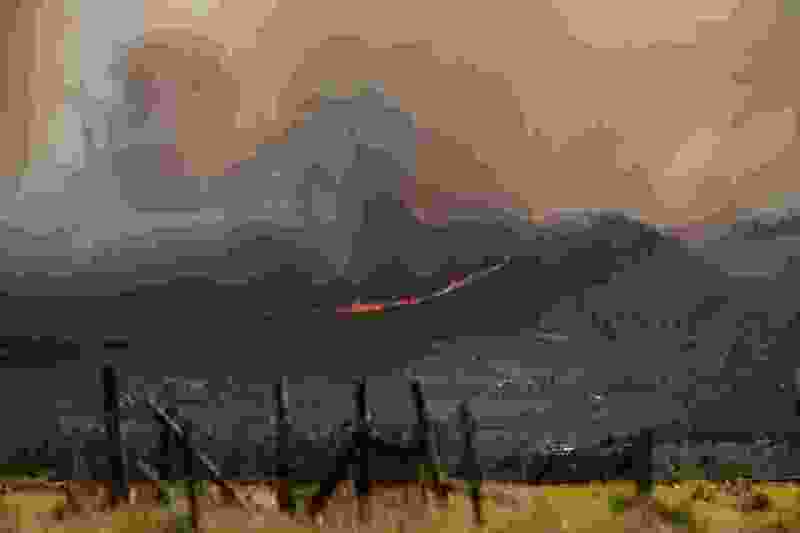 The fire continued to spread into the evening, forcing officials to close the highway near Fruitland in both directions from just north of Strawberry Reservoir to the Freedom Bridge near Duchesne, the Utah Department of Transportation announced on Twitter. At about 9 p.m., the fire jumped the highway. The fire was predicted to grow throughout Wednesday, as it burns through dry timber, grasses and shrubs. The fire is only about 4 percent contained. Similar conditions over the previous days helped the blaze spread quickly, consuming an area quadruple in size from Sunday into overnight Monday, destroying 20 to 30 homes and structures and prompting residents to evacuate. Gov. Gary Herbert has issue a state of emergency for all of Utah. Wednesday afternoon as the fire traveled northwest, Wasatch County Emergency Management issued mandatory evacuations for residents living in the 40 Dam Acres and Pinehollow neighborhoods near Strawberry Reservoir, in addition to the Aspen Grove campground and marina, according to a post on the Facebook page. Those residents were under voluntary evacuation orders Tuesday. Residents in two neighborhoods south of the Highway 40 corridor from Fruitland to Starvation Reservoir were asked to evacuate Tuesday. Many of those families temporarily turned over horses and family pets to the Duchesne County Fairgrounds, which is currently holding about a dozen horses and 30 to 40 cats and dogs. Officials believe that, as with many wildfires burning across the state, human activity caused the Dollar Ridge Fire. Conditions elsewhere in the state remained much the same as they were (and have been) in the basin: hot, dry and windy — perfect weather for fires to grow. All seven wildfires burning in Utah on Wednesday, according to the Utah Fire Info map, fell within the boundaries of “red flag” warnings. The National Weather Service issued the warnings across much of the northern, western and central parts of the state. Red flag warnings indicate high winds, low humidity and high temperatures, all of which point to severe fire risk. Despite the weather conditions, crews seemed to be gaining ground, albeit slowly, on other blazes, including another human-caused fire, this one near Pine Valley, north of St. George, called the West Valley Fire. As of Wednesday evening, firefighters have 20 percent of the nearly 12,000-acre blaze contained — up significantly from Tuesday. Officials there advised residents to clear vegetation from their homes to protect against the fire if it spreads to residential areas. A public meeting about the blaze is scheduled for 6 p.m. Thursday at the Pine Valley Fire Station. Firefighters also seemed to be gaining on the Willow Patch Fire, east of Richfield in Sevier County. The fire has burned 4,788 acres, but is about 60 percent contained, according to a news release. Windy conditions caused a few flare-ups Wednesday at the the Black Mountain Fire, caused by a vehicle accident near Minersville. Despite that, the fire was holding near 6,000 acres and was reported to be about 98 percent contained. The other fires burning in the state — the Saul’s Canyon, Trail Mountain and Willow Creek fires — were also nearing containment, according to the wildfire map. Local, state and federal agencies and officials Tuesday urged people to be careful not to ignite more fires over Independence Day. Many counties in Utah have banned fireworks on unincorporated lands, and some cities have instituted similar restrictions. Where they are permitted at all, fireworks may be used to celebrate Independence Day from July 2 to July 5, and from July 22 to July 25 for Pioneer Day. For a list of local fireworks restrictions, visit firemarshal.utah.gov and scroll until you find the link for 2018 fireworks information. Clarification: 6:31 p.m, July 4, 2018 >> An earlier version of this story incorrectly stated that a community was under mandatory evacuation orders.